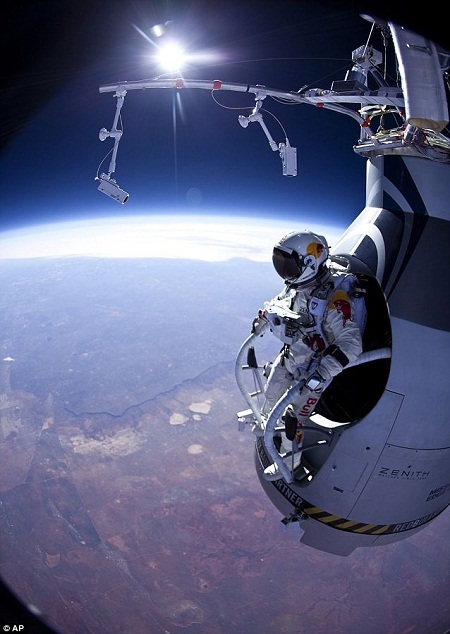 As he plummeted 24 miles to Earth at a speed of 833 mph, Felix Baumgartner went into an uncontrollable "death spin". To make matters worse he couldn’t see, because his visor was covered in condensation. losing consciousness by going into a spin during the supersonic descent and becoming unable to open his parachute. In the weeks leading up to the jump, Baumgartner was coached by leading sports psychologist Dr. Michael Gervais, who used guided meditation and visualisation to install new mental imagery, dissolve anxiety and enhance Baumgartner’s ability to focus on the moment and perform under pressure. Gervais says, "We all have inside us what we need to fulfil our potential. We just need to master our craft, let go of the outcome and trust ourselves to make the right decision in each moment." After the jump, Dr. Andy Walshe, Head of Red Bull’s High Performance division was asked, "What are the limits of human potential?" Walshe replied, "We have some amazing talent in all our Red Bull teams, but I’ve yet to meet anyone who has the consciousness of the Dalia Lama, the creativity of Steve Jobs, and the ability to perform under pressure like a Special Forces commando. We’ve only just scratched the surface of human potential." The mind is at rest when the body is in action. May you RIP – Rest In Presence. A man died and went to Heaven. As he stood in front of the Pearly Gates, he saw a huge wall with clocks on it. He asked, “Why have you got so many clocks?" “Those are Lie-Clocks," replied St. Peter. "Everyone who has ever been on earth has a Lie-Clock. Every time you lie, the hands on your clock move." “Oh”, said the man. “Whose clock is that?" “That’s Mother Teresa’s”, replied St. Peter. “The hands have never moved, indicating that she never told a lie." “Incredible”, said the man. “And whose clock is that one?" St. Peter responded, “That’s Abraham Lincoln’s clock. The hands have moved twice, telling us that Abraham told only two lies in his entire life." "Have you got a clock for Lance Armstrong?" asked the man. St Peter replied, “We’re using it as a ceiling fan." This entry was posted by admin on February 1, 2015 at 5:32 am, and is filled under Sunil Bali, The Art of Awesome Living, The Book of Awesome Humour. Follow any responses to this post through RSS 2.0. Both comments and pings are currently closed.